Americans love pizza! It’s estimated that 93 percent of Americans eat at least one pizza per month. Artisanal make-at-home pizzas are a growing trend, so GE’s FirstBuild™ challenged its engineers to invent a residential pizza oven that would make restaurant-quality pizza in minutes—and create the perfect pizza regardless of the style—from Neapolitan to deep dish to New York pies. The first step was sending engineers on a nationwide quest: tasting pizza and testing restaurant pizza ovens of all types to learn how a residential in-wall pizza oven could feature precise temperature control to make the best pizza of any style. FirstBuild engineers gathered data from the ovens of some of the top pizzerias in the country. The cross-country trek included stops at Zero Zero in San Francisco, Paulie Gee’s in Brooklyn and Coals Artisan Pizza in Louisville, Ky. 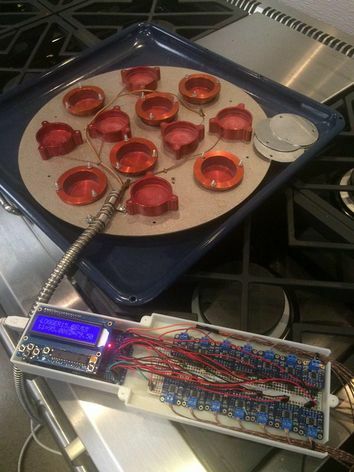 Using a data collection device, engineers from FirstBuild went on the "Great American Pizza Tour," from coast to coast to collect the “thermal signatures” of these famous pizza ovens. The pizza oven tester was nicknamed "Digital Pizza." It is a collection of thermocouples that connect to a computer via a custom-built data logger that used components from Adafruit. Using the data, the engineering team created a baseline performance of pizza ovens and technology to create the ultimate home pizza oven; an oven that can cook your pizza with restaurant-quality results using the precise settings that you select—making anyone a pizza master. This marvel of engineering is unique in many ways: Its compact internal ventilation system does away with the need for elaborate exterior ventilation or complicated installation; it fits into a standard wall oven cavity; and it operates from a regular electrical outlet.